We all have our dream programs for piano recitals. Jean-Efflam Bavouzet, for his November 24th performance in Lincoln Hall at Portland State University, came up with one which would serve for me: Beethoven's "Pastorale" sonata op. 28, Ravel's "Gaspard de la Nuit," the first seven Debussy preludes, and Bartok's only solo piano Sonata. The Beethoven was changed along the way to the Waldstein sonata, close enough. But the trouble with dream programs is that they're usually coupled with dream interpretations. Touring pianists usually have strong personalities and opinions – what are the chances his dreams would be mine? Don't hold your breath. But many of his interpretations were so close they did feel like affirmations. I wasn't usually converted by the ones which were very different, but I was always moved to serious consideration. Technique was never the issue. 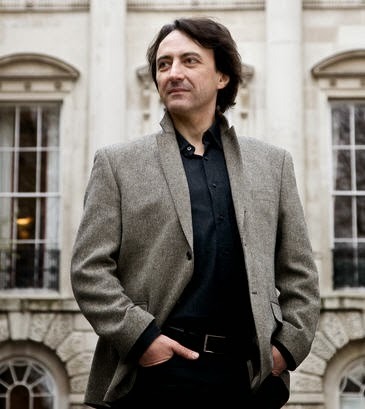 True, in passages of the most hair-raising digital difficulty, Bavouzet was often not the note-perfect machine that seems de rigueur these days, even when it comes at the expense of going all out. But as the concert developed, every time I wished he had played something a different way, I could at the same time recall something else he had played just that way. His control over shadings of tone, dynamics and pedaling was superb. And yet he didn't shrink from taking risks, even when some left him hanging by his fingernails. The overall impression was one of passion, argument and engaging narrative. The Waldstein set the course for the whole program. Bavouzet's tempo was moderate, if still plenty challenging, giving the composer's inspirations time to blossom. The pianist offered a generous whiff of the flowers, for example, near the beginning of the recapitulation in the first movement, where Beethoven seems to forget about celebrating the return to the home key and temporarily heads for la-la land. The final prestissimo was all the more electrifying, its exuberance aided by flawless octave glissandi. And yet it couldn't be called a Romantic interpretation. Bavouzet's bio mentions working closely with Pierre Boulez, and it wasn't hard to imagine the influence of the famous French composer, conductor, and theorist – always intelligent, always musical, not without hedonism but perhaps somewhat too consciously intellectual. And yet, with "Ondine," the opening Ravel movement, I was completely carried away. The pianistic world seems to have finally found the key to "Gaspard", if the number of young virtuosi peddling the classic test piece in recent years is any indication. And yet, how often have I listened with amazement to a flawless rendition, while at the same time nostalgic for the poetry of, say, Ashkenazy's stellar recording from my formative years in the 60s. 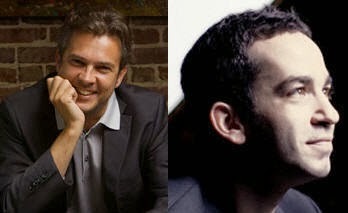 In particular, these pianists seem to forget that "Ondine" is a seduction. Bavouzet did not for one second forget! He gave the nymph all the time she needed to sing irresistibly out of her watery home – and his treatment of a couple of glissandi which morph into arpeggios was beyond perfection, utterly magical – but when it came time for her to make her move, the wave crashed with harmonious abandon, impossible to outrun. "Le Gibet," in contrast, was unsettling, and no doubt was intended to stand out from the usual atmospherically gloomy interpretation. Bavouzet seemed to emphasize the central image of a hanged body reddened by the setting sun by putting some bite into the repeated tolling of the B-flat octave. But the text that inspired the work refers only to a bell "below the horizon" and other faint sounds. That octave was anything but, and quickly wore out its welcome. The fantastic, and fantastically difficult "Scarbo" instantly drew us back in again as Bavouzet seemed to transmute the terrors any pianist must feel, contemplating its performance, into a totally absorbing narrative. If it had been a movie, it would have been Hitchcock. If anything I wished he had taken more of the opportunities Ravel presents to mercurially break up the often driving rhythm. But he was master of the terrifying climaxes, and the maddeningly offhand ending was perfect. The first seven Debussy preludes finally gave us a chance to hear Bavouzet take on quintessentially French repertoire. And, while they do offer many technical challenges, unlike "Gaspard" they are nothing for a pianist of his caliber to lose any sleep over. Again the range of interpretations was fascinating. What stood out all through was Bavouzet's devotion to clarity and balance. He studiously avoided the pedal-drenched wash many pianists associate with Debussy. Too studiously in the atmospheric preludes "Voiles," which was merely restless, and "Les sons et les parfums tournent dans l'air du soir," which seemed rather anxious to get indoors before curfew, but which had beautifully judged passages including the tricky final fadeout. On the other hand, "Danseuses de Delphes," "Les collines d'Anacapri," "Des pas sur la neige," and "Ce qu'a vu le vent d'Ouest" were all sharply etched, highly engaging anecdotes. Notable moments were one inspired pedal wash that added poignancy to a "melancholy memory" in "Des pas sur la neige," and the dramatically shaped final climax in the rambunctious "Ce qu'a vu le vent d'Ouest," leading to a perfect slam-bang finish. This last work is one of the few preludes that approaches "Gaspard"-like virtuosity, and again, Bavouzet's brisk but moderate tempo enabled him to put on an awe-inspiring display where many pianists merely scamper. There was absolutely no scampering, either, in Bartok's only piano sonata, an inexorable and irrepressible work, which Bartok himself was careful to play only before the most musically sophisticated audiences of his time. Today's audiences, having been exposed to punk rock and distortion effects, are less easily fazed. The first movement's signature repeated octaves pounded home with devastating effect while surrounding outbursts cut in like a flock of hatchets – not to punish the piano or audience, on the contrary, to sculpt a thing of wild beauty like a granite crag. In the slow movement, in which the repetition is stretched out across plangent dissonances like distant tolling bells, Bavouzet's apparent aversion to atmosphere led him astray, creating a dry, even sterile artifact. However, he again tuned in brilliantly to the dangerously, even insanely exuberant finale, and the final explosion elicited a huge ovation from the sold-out crowd. One would think Bavouzet would be about ready to drop, but he strode out and gave us "something calmer" as he wryly put it, the eighth Debussy prelude, "La fille aux cheveux de lin," for an encore. There are a couple of weaving passages, like a lover's hands running through long wavy hair, I wish he had lingered over, but even so, it was another exquisitely drawn image. If only the audience had let the final harmony ring in the ear even a little before obliterating it with their oohs and aahs. Congratulations are in order for Portland Piano International and its new artistic director, Arnaldo Cohen, for luring Jean-Efflam Bavouzet to a rare West Coast appearance. It may not have been the performance of my dreams in every detail, but how could that ever be? It was close enough. I left the hall warmed by a master musician's touch, which unlocked so much of my innermost world and let it live out loud. Jeff Winslow is a composer, pianist, engineer, and a member of Cascadia Composers. 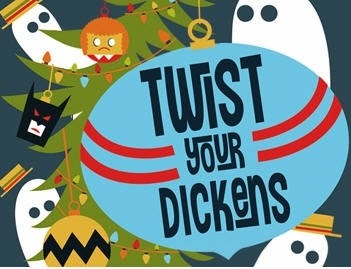 Last Friday evening (November 22nd), I attended "Twist Your Dickens," a high-energy, send up of Charles Dickens's "Chritsmas Carol" at Portland Center Stage. It takes a very off-kilter approach to the classic story, veering widely over time and genre (with plenty excursions into TV and movies) and relies on improvisation to fuel the laughter. The production was originally created by The Second City, a comedy-centric theater company that is based in Chicago. "Twist Your Dickens" does have a backdrop that looks out on London, circa 1840s, but it quickly interjects modern characters and language into the first scene where Scrooge is busy being his greedy self. So George Bailey from "It's a Wonderful Life," Orphan Annie, Dorothy from "The Wizard of Oz," and a host of others get thrown into the mix. Along the way, there's some crude language and songs that plunge briefly into poor taste (Frosty the proctologist), The play's style of humor can also be offensive, especially to religion and people with disabilities, but that is part of the game in this fast-paced, skit-oriented performance. Starring the irrepressible Craig Cackowski as Scrooge, the other members of the cast breeze through a blur of characters that range from Bob Cratchit to Batman. Chantal DeGroat, Sam Dinkowitz, Nicholas Kessler, Beth Melewski, Lauren Modica, and John San Nicolas make an astonishing number of costume changes. Oh yes, the ghosts of the Past, Present, and Future have a role as well, and there's room for audience participation, plus guest cameo appearances like Grimm's Sasha Roiz, who introduced one of the skits. I enjoyed the show even though I didn't find it as funny as the audience around me. They were laughing pretty hard all evening long. “A Shakespearean sandwich” was an apt description given by guest conductor Justin Brown to describe the Oregon Symphony concert on Saturday (November 15) at the Arlene Schnitzer Concert Hall. The outer portions of the sandwich consisted of music from Verdi’s “Macbeth” and Berlioz’s “Roméo et Juliette.” Ravel’s Piano Concert in G major with soloist Inon Barnatan provided the filling. This was Barnatan’s second appearance with the Oregon Symphony, and he teamed up well with Brown, who is the music director of the Badisches Staatsheater Karlsruhe (Germany) to give a brilliant performance of the Ravel. With Barnatan at the keyboard, Ravel’s Piano Concerto shimmered with a slightly jazzy sentiment. Whether playing dizzyingly fast passages or taking a leisurely stroll around the ivories, Barnaton knew how to walk the fine line between classical and jazz that Ravel created for this piece. The orchestra matched his artistry with a variety of impeccably articulated sounds, which included brief, jazzy slurs, beautiful phrases for the harp, crazy high notes for the bassoon and French horn, and frenetic yet impeccable trumpeting (with kudos of principal trumpeter Jeffrey Work). Berlioz called “Roméo et Juliette” a “dramatic symphony” rather than an opera or a cantata. It is a large scale work for orchestra, chorus, and soloists that lasts over 90 minutes. For its concert, the Oregon Symphony played the orchestral excerpts, five in all, which depict some of the major themes of the story. However, the music, as a colleague of mine pointed out, never really moves to a minor key to bring out the tragic sense of the story. Instead, Berlioz conveyed the events in a different way, with dramatic shifts and glorious sonic effects. But he also got caught up offbeat elements of the story like the Queen Mab Scherzo, which evoked a fairy-like presence who flits about. Overall, the orchestra, urged on by Brown, gave a ravishingly lush account of Berlioz’s work. The wild beginning with a fight scene depicted by the speeding strings against the grand sonority of the brass was outstanding. The second movement, “Romeo Alone,” was filled with a sense of yearning and featured a quartet of bassoons, terrific pizzicatos from the cellos against a lovely passage by principal oboist Martin Hebert. The solitary figure of Romeo suddenly transitioned into a boisterous one and the movement ended with a bombastic depth charge for the entire orchestra plus two pummeling sets of timpani ably played by principal percussionist Niel DePonte and principal timpanist Jonathan Greeney. The higher strings created a foggy and mysterious atmosphere for the third movement, “Night Scene,” while the bass section made the sound of light footsteps. Among the many highlights of this movements were cello section that laid down an exceptionally warm melody and principal flutist Jessica Sindell in a lovely solo. The strings fashioned a flighty atmosphere in the “Queen Mab Schero,” but the movement also featured hunting horns (French horn section) and duet between the harps and low bassoons. The fifth movement, “Romeo at the Tomb of the Capulets” roamed all over the map with dramatic pauses, plaintive calls by Juliet (played superbly by principal clarinetist Yoshinori Nakao), a wild explosion of sound, and two final, plucked notes at the end, signifying death. The concert began with an evocative performance of the ballet music from Verdi’s “Macbeth.” The melodious strings, the beguiling flute solo (Sindell), the wiggly trumpet line, the noble sentiment in the duet between principal cellist Nancy Ives and principal bassoonist Evan Kuhmann, were some of the most vivid memories from this piece. It made me want to hear the rest of the opera. Brown, who conducted all of the pieces without a baton, used a very expressive and energetic style. The orchestra astutely channeled his variety of brief gestures, including a number of signals that looked to be very challenging to read. The great thing about this orchestra is that they do not get rattled by much of anything. The musicians picked up on the emotional content of Brown’s conducting and went with it. That is just another reason not to miss any upcoming concert that this orchestra presents. Its musicians continue to play at the topmost level, and that is just amazing. The Portland Youth Philharmonic opened its 90th season on Saturday (November 9) at the Arlene Schnitzer Concert Hall with a satisfying concert that ranged from well-known chestnuts to a world premiere. The well-known works on the program were Antonín Dvořák’s “Symphonic Variations” and Edvard Grieg’s Piano Concerto in A minor, which featured PYP concerto winner Hannah Moon. The lesser known work was Howard Hanson’s “Elegy,” and the brand new piece was Kenji Bunch’s “Supermaximum,” which was completed just a few months ago. All were played outstandingly by the PYP, under the direction of its music director David Hattner. Kenji Bunch’s hypnotic “Supermaximum” received its world premiere in orchestral form. In its original chamber ensemble form, “Supermaximum” toured to much acclaim by the East Coast Chamber Orchestra.” After an enthusiastic performance in April by Camerata PYP (PYP’s chamber ensemble), Hattner asked Bunch to rearrange “Supermaximum” for orchestra. Bunch is an alumnus of the orchestra and, after graduating from Juilliard, has made a name for himself as a composer and performer (viola), working in New York City before returning to Portland earlier this year. Inspired by the rhythms and sounds of prison chain gangs, “Supermaximum” started out low and slow like a primeval grunt with the violas leading the way. The French Horns joined with a slight snarl and the entire orchestra gradually fell into step, accented by rhythmic stomping on the stage floor and slapping of the sides of instruments. A call and response style seemed to emerge and climb higher and higher before fading away, only to be restarted by cellos and, later, the bass violins. Near the end of the piece, the trombones and trumpets stood up and added some swagger to the piece that gave it an edge of defiance. After waiting a long time for a cell phone to quit ringing, Moon, who is also a member of the viola section, launched into Grieg’s Piano Concerto and gave a passionate performance. The fluidity of her phrasing was exceptionally smooth and well-balanced. She seemed to become more expressive as the piece developed, and the orchestra, guided by Hattner, accompanied her with sensitive playing. Starting with a sinewy opening statement, the orchestra bathed Hanson’s “Elegy” in lots of warm colors. Hanson dedicated the piece to conductor Serge Koussevitzky, who was one of the most highly regarded champions of new music. Urged by Hattner, the strings strongly brought out melodic themes that created a mood of empathy with a tinge of sorrow mixed in. Principal oboist Kenny Regan played several solos with grace, and the orchestra fashioned a lovely quiet sound at the end that resonated well with the audience. The orchestra gave Dvořák’s “Symphonic Variations” an enthusiastic performance, delving into all of the thematic permutations with gusto. The musicians excelled at varying the dynamics so that each of the 27 variations had a flavor of its own. Principal flutist Erik R. Madison deserved the highest marks for his exceptional playing. The fugue section was especially exciting with a wild accelerando that had the orchestra rocking out. Even the brief pauses were exciting. It was a great piece with which to close out the concert, and the audience left with a smile. After intermission, Mary Anne Rees, PYP’s acting executive director, announced from the stage that Portland Mayor Charles Hales designated November 9th as PYP Day in honor of the orchestra’s 90th season. Rees also mentioned that the orchestra will play in Chicago’s Millennium Park in late July of next year. That should be an exciting concert for the musicians of the PYP. It is certainly a much needed feather in the cap for Portland’s cultural scene. I had heard about the Piano Push play project, started by Meagan McGeorge, and even passed a woefully locked (!) piano in Pioneer Square last month, but had so far failed to connect with the pianos until last Friday, when strolling at dusk past the Portland Art Museum, I heard the sounds of the Chopin b minor scherzo. In the warm air, the sound was like a hybrid element floating towards me, natural, but still thrillingly unnatural. Outdoor piano music is strange, yet it felt just right all the same, like dipping my toes in a warm brook. In the plaza which leads up to the Art Museum bookstore stairs, there are places for people sit on the steps facing the performer, walk through, or simply eddy in the center of space like warm water round a stone. I was just in time for the last performance on the outdoor Push Play pianos, which have been in Portland for the past few months. A concentrated and sober Jesse Waldman of PSU was nimbly completing some of the seemingly endless recapitulations of the theme on a not entirely tuned piano (at least, it seemed pre-well-tempered in the key of b minor) while a very enthusiastic member of the public, (who might be labelled "transient", but probably has a preferred name, like Bob), conveyed his enjoyment by loud humming, whooping, weeping, and generally showing all manner of enthusiastic reaction to the music while sitting on a ledge not three feet from the performer. They say it was this way in the day of Mozart at the opera, and there were no open containers or throwing of peanuts, so I felt no compunction against this character; at the same time I marveled at the outdoor pianists themselves, who needed a little extra forbearance given the circumstances: the picture of unrestrained revelry right next to one of sober musical application is not often seen. After Mr. Waldman finished the Chopin scherzo, singer Maria Karlin took the stage, accompanied by Meagan McGeorge. They started the slow, moving aria, "Lascia Ch'io Pianga" by Handel. Ms. Karlin's singing was authoritative and immediately captured the passersby. Her ornamentation on the repetition of the theme was solidly felt and unrushed, providing a luxurious languor to the outdoor setting. The sound lured people in to mill quietly in an undetermined manner in the open space of the plaza, like schools of fish near a possible food source. In addition to the fairly intentional audience seated on the steps to the museum bookstore, ten or twenty people paused, and more passed, all quiet. A couple hovered uncertainly and prayerfully for a few moments right in front of the singer and pianist and then simply plunged down on the spot in twain, as if they were being sucked down a whirlpool drain. Runners passing through the north park blocks paused on the ledge of the plaza, putting up their feet and slowly doing leg stretches in time to the music. A group of people on those wheel-bike things hovered like bees for several moments before getting a cue from their Star Trek-like commander and moving silently on. Ms. Karlin went on to sing Purcell's "When I am Laid," "Deh vieni no tardar" from Mozart's Marriage of Figaro, Puccini's "O mio babbino Caro," and "Asturiana" from "Siete Canciones Populares Espanoles" by Manuel de Falla. During one of the pieces, the increasingly avuncular Bob took out his harmonica and actually blew a note in tune. Pretty impressive. Ms. Karlin and Ms. McGeorge gave up the piano to Asher Fulero, a pianist with a full-bodied piano sound, and a dramatic, impressive dynamic range. His grip on this piano really made it sing. His music has a pop/jazz sound, and after his first piece , his version of "On the Chin", by Tortoise, which sounded familiar, people were making guesses as to who the composer was. (No one knew the Tortoise tune and I myself was guessing Burt Bacharach).His second piece was inspered by Chopin's Impromptu in C minor, which he analysed harmonically as an OSU student and rewrote. It contains recognizable and tantalizing fragments of the Impromptu, but I couldn't identify it. It was during Fulero's impressive rendering of a crescendo to a forte in this piece when an art museum security guard approached Bob, who had just gone one step too far by making a general request of the audience for a light. He was motioned off the property and restricted to the park blocks, a drama resulting in a shouting and motioning that seemed to be a twilight pantomime of the piano music. Well done, Bob! You have to say he really feels things, and is a great improviser and art lover, even if his understanding of the classical piano recital etiquette is a bit tarnished. Mr. Fulero then peacefully went on to his last tune, "Squirming Coil," by Phish. The piano was then taken up by other pianists, most of whom were PSU students. Not necessarily in order, some of them are: Theresa Silveyra, who gave a vigorously healthy, rhythmic version of "Sleepwalker's Shuffle" and "Nightmare Fantasy Rag" from "The Dream Rags," by William Albright; Meagan McGeorge, who played "Mysterious Barricades" by Couperin, and preludes by Galuppi and Kuhnau; and Liz Kohl, who ended things popularly with "Somewhere out There" from "Fieval Goes West". After the recital, the soprano Maria Karlin explained the genesis of her connection to Meagan McGeorge: the two met in a disco band, named Ancient Heat, and went on to another one called Federale, which is in the spaghetti western genre.Mr. Fulero and Ms. Karlin know each other from OSU, where both studied music. Meagan McGeorge is the well-known instigator of the Piano Push Play project, which, if this recital is any indication, may become a wildly popular way to share piano music in urban settings. After the recital, the piano was not at all left lonely, and was still being played vigorously around 10 pm, when I left. The Arlene Schnitzer Concert Hall was filled to near capacity on Saturday evening (November 2) not only where the audience sits but also on the stage as well. The occasion was the first of two performances by the Oregon Symphony of Benjamin Britten’s mammoth “War Requiem,” which requires large orchestral forces, huge choral ensembles, and soloists. The result of the instrumental and vocal artistry, guided by the orchestra’s music director Carlos Kalmar, was superb. I even enjoyed this live performance more than the famous recording of the “War Requiem” that was done with Galina Vishnevskaya, Peter Pears, Dietrich Fischer-Dieskau and the London Symphony Orchestra under the composer himself. That’s because the Oregon Symphony, the Portland Symphonic Choir, the Pacific University Chamber choir, the Pacific Youth Choir, soprano Marina Shaguch, tenor Thomas Cooley, and bass-baritone Andrew Foster-Williams expressed the complete emotional range of the music in such way that it made a personal connection. It was flat-out a stunningly, magnificent concert. Britten wrote the “War Requiem” in 1961 after being commissioned to celebrate the reopening of St. Michael’s Cathedral in Coventry, England. The cathedral had been bombed in a German air raid in 1940. 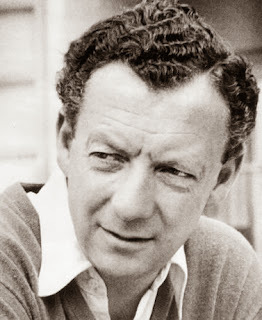 Britten, a lifelong pacifist, dedicated the work to four friends, three of whom had died in WWII. He used texts from the Latin Mass for the Dead and nine poems of Wilfred Owen, a British soldier who died at the end of WWI. Before the concert began, I was not in a particularly good mood. I even arrived at the concert with some trepidation because I thought that the “War Requiem” might box me on the ears and leave me nonplussed. Earlier in the week I had listened to the recording that Britten had made with Vishnevskaya, Pears, Fischer-Dieskau, and the London Symphony Orchestra, but it didn’t connect with me. I had sung the work in 1997 with the Oregon Symphony as a member of the Portland Symphonic Choir in concerts that were led by the orchestra’s former music director James DePriest. We didn’t have the built-out stage area back then and everyone was packed like sardines on the stage of the Schnitz except the children’s choir. They sang from the dress circle area of the balcony and created coordination problems. This time around, the Pacific Youth Choir was placed just offstage and the coordination between Kalmar and choir was spot on. The orchestra was divided into two groups, with the principal players forming a small ensemble to Kalmar’s right and the rest of the orchestra led by the assistant principals. The two groups took advantage of the stage extension that was built out into the audience, taking away a few of the first rows. The Portland Symphonic Choir, the Pacific University Chamber Choir, and soprano Marina Shaguch sang from behind the orchestra in a section that extended over part of the regular stage area. The choruses sang text from the Latin Mass, accompanied by the large orchestra. Tenor Thomas Cooley and bass-baritone Andrew Foster-Williams sang the poetry of Wilfred Owens, supported by the smaller ensemble of instrumentalists. From the very first note of this concert, I felt that I was hearing something ultra-special. The opening sound was heavy and ponderous, but at the same time it felt like a fog was lifting. The adult chorus began singing “Requiem aeternam dona eis” and later the children’s chorus followed with “Te decet hymnus.” There was a softness and a sadness that would reenter at times later in the work. Both choirs sang with terrific diction and a wonderful balance of tone. Kalmar used hands to signal exactly when to taper a phrase or close off a word at the end of a phrase, and it was magical. The choirs also had plenty of power when they sang at full volume during the “Dies Irae” and the “Libera Me” and they performed the “Quam olim Abrahae” fugue with relish. Shaguch had an amazing amount of volume and tempered it with warmth, coolness, and other emotions as was needed to convey the text. She had a brief moment in which she seemed to experience a slight power outage, but she recovered quickly and was a beacon of vocal light throughout the performance. Cooley and Foster-Williams represented the two soldiers who reflect on their experiences in wartime. Some of their words were chilling, as when they, in a duet, described their closed encounters with Death, as in “We whistled when he shaved us with his scythe.” Cooley very effectively used a straight tone (no vibrato) when he sang some of the most poignant words. Foster-Williams, displaying a voice that could be demonstrative one moment and reflective the next, always had the center of the tone. The orchestras (large and small) played with great depth of understanding. The brass section excelled in the fiery and warlike sections, but they deftly used mutes during the quieter passages. The double snare drums, timpani, and bass drum during the “Dies illa, dies irae” was molto tremendous. The strings and woodwinds played impeccably. Kalmar gave the performance direction and shape that made it a superb experience – one that caused an immediate and heartfelt standing ovation. Portland Opera probes obssesion in all-new production of "Salome"
Portland Opera probed the edges of sexual obsession in a brand new production of Richard Strauss’s “Salome” on Friday evening (November 1) at Keller Auditorium. 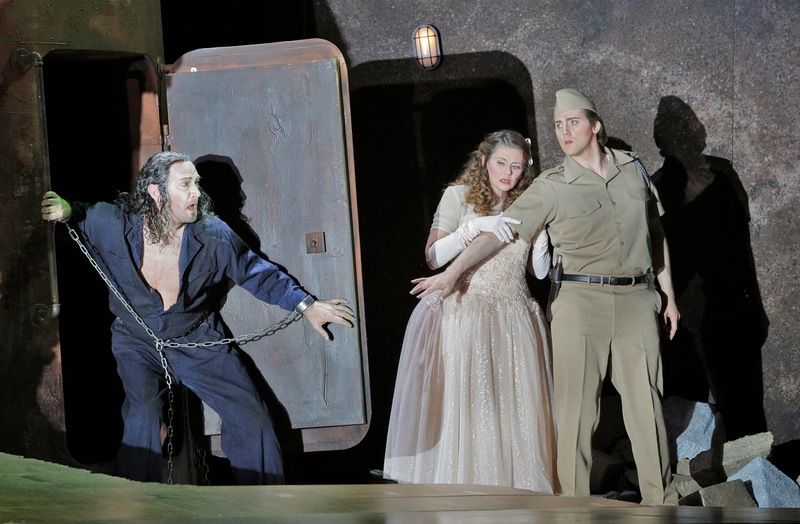 Starring Kelly Cae Hogan in the title role, the performance featured forceful and expressive singing that matched well with evocative playing from the orchestra under the baton of music director George Manahan. Portland Opera had staged “Salome” only twice before, in 1990 and 1975; so this production was long overdue. The opera is loosely based on the New Testament story as retold by Oscar Wilde. The events center on Herod’s imprisonment of Jokanaan (John the Baptist) on the behalf of Herod’s wife, Herodias. She had divorced her first husband in order to marry his brother (Herod), and that marriage was considered illegal and immoral by Jokanaan. Herod and the captain of the guard (Narraboth) are bewitched by Herodias’s daughter Salome, but she ignores both of them because she is obsessed with Jokanaan. Herodias wants Herod to do away with Jokanaan, but Herod is afraid of Jokanaan, who is considered a holy man. Salome becomes so fixated on Jokanaan that she wants to kiss his lips and have him as a lover, but he is repulsed by her and refuses her. As you can guess, these obsessions lead to no good end. 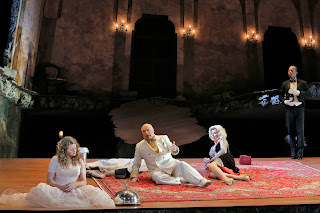 Sashaying about in a flouncy prom gown, Hogan’s Salome reveled in an emphatic and unquenchable desire for Jokanaan that was palpable enough to draw a combination of nervous laughter and gasps of disbelief from some of the audience. Her soprano delivery was secure and spot-on throughout the performance, even when she was enraptured with the decapitated head of Jokanaan. 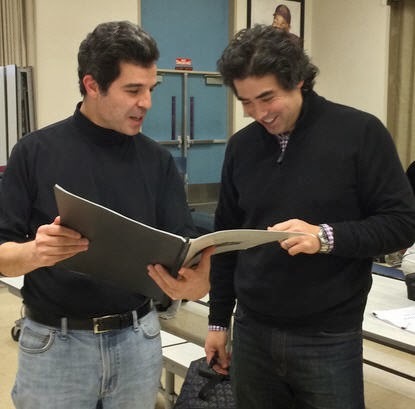 As Jokanaan, David Pittsinger sang and acted like a man possessed, but in some louder passages, the orchestra overwhelmed his voice, which was consistently lovely, even in the most stentorian passages. Alan Woodrow ably conveyed a decadent Herod whose desperate infatuation for Salome got him into trouble. Woodrow’s helden tenor voice easily scaled up and over the many high passages, embodying the highly emotional state of Herod’s character. Rosalind Plowright created a cool and calculating Herodias whose willful personality was second to none except her daughter’s. Ric Furman’s Narraboth was totally smitten with Salome, and when she touched him, he practically melted into a puddle. His singing was exceptional, conveying paroxysms of youth and naiveté. The principals were supported by cast of excellent singers in lesser roles, including Melissa Fajardo as the Page to Herodias, Jonathan Kimple as the First Soldier, Konstantin Kvach as the Second Soldier, Andre Flyn as a Cappadocian. Jon Kolbet, Ian Jose Ramierez, Carl Halvorson, Marcus Shelton, and Darren Stokes formed the contingent of Jews while Anton Belov and David represented the Nazarenes. George Manahan led an inspired performance by the Portland Opera Orchestra, which explored the many dynamic contrasts of Strauss’s music, such as the wind that Herod only could hear and the lingering tones just before Jokanaan was beheaded. Director Stephen Lawless deftly delayed some actions as long as possible in order to heighten the drama, such as when Jokanaan stepped out of his cell for the first time and also when his severed head was not revealed until near the end of Salome’s final, long aria. Also impressive was the moment when Jokanaan poured sand over Salome as he suggested that she get baptized by the Sea of Galilee. However, one of the more odd gestures was Narraboth's strange fascination with his knife before he killed himself with it. 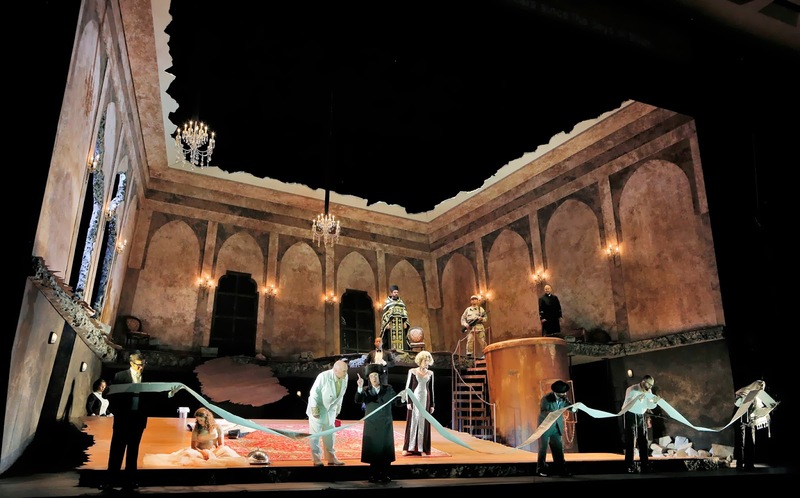 The production, designed by Benoit Dugardyn for Portland Opera, updated the story to contemporary times, placing it somewhere in bombed-out shell of a palace somewhere in the Middle East. A huge collapsed floor served as a platform for part of the action. Directly above, most of the roof had been blown away, exposing the nighttime sky. A stairway on the right-hand side skirted a big holding tank where Jokanaan was held. The Dance of the Seven Veils, choreographed by Matthew Farrao, was marvelously conveyed by six dancers, suggesting the Herod’s confused emotional state. As the dance drew to a close, he discovered the real Salome, but his infatuation remained strong until he found her later. The sheer repulsiveness of her state of rapture with Jokanaan’s severed head is the final impression of this opera, proving that “Salome” still has the power to shock.